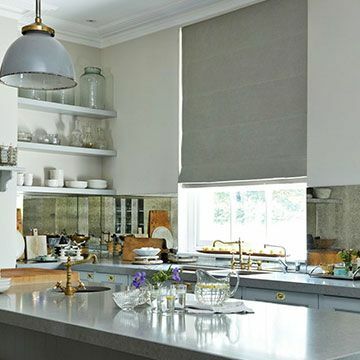 Browse our range of stylish kitchen blinds, read our practical advice and tips and make an appointment with an expert advisor. We’ve hundreds of colours and designs to choose from. We bring them to you so you can browse at home. Discover kitchen blinds that are beautiful and practical. Our huge range of blinds includes specialist fabrics and finishes that make them ideal for kitchens. We’ve collated them all here for you, so you can find a style solution you love. Explore a range of colours, styles and patterns. You don't need to choose right now, we'll bring our whole range to you and talk you through your options at your in-home appointment. We’ve put together this handy guide to help you select the perfect Roller blinds for the heart of your home. Design inspiration for transforming the heart of your home.